Mattias Jonsson is a 25-year old plumber with a dramatic story to tell. He has a background as a successful boxer and he reached early European elite level. Many negative circumstances made however his sports career come to a painful and life-changing end. The downward spiral went via drug abuse, violence, loss of friends and mental and physical decay. Mattias’ wake up call came when his wife became pregnant and presented him with an ultimatum “change life style or leave”. Facing this afflicting reality and the alternatives became a turning point. He entered a new and demanding redirection to a better, safer, more meaningful and creative life. Sadly, Mattias sustained a life-threaten multi-trauma injury in a 16-meter fall 2007. He had multiple fractures of legs, ribs, and skull and also crushed his spleen and liver. On top of these injures he also broke his neck which left him tetraplegic with no hand function whatsoever. 9 months after this trauma and months of intensive care and rehabilitation, he had a stroke that took away some of the remaining functions of his right arm. The cruel fate once again challenged his will power. 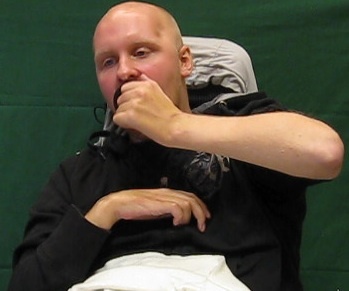 In 2009 Mattias went through surgical reconstruction of hand function on his left side. His focus was to train after surgery to reach the best possible level of performance and he did amazingly well (see photograph above at one-year post-surgery follow-up). Earlier this year he had correction of deformities of his right stroke affected arm. In the fall of 2010 Mattias will return to his former workplace on a half-time basis and will then mainly be dealing with administrative tasks. During the last few years, Mattias has devoted much of his time to inform high-school students about the potentially disastrous effects of drugs. Many caregivers and friends are happy to watch the psychological development and physical progress during this young man’s comeback. We wish you good luck.